This traditional round rosette features an elegant rope border. Beautifully crafted from solid, forged brass, it adds a classic touch to any door. Popular finishes from polished chrome to oil-rubbed bronze give you options for every room in the house! Not for use on pre-drilled doors. Traditional round rosettes are always in style. 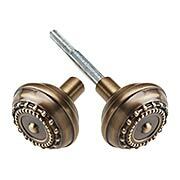 Beautifully crafted from solid, forged brass, they add a classic touch to any door. Popular finishes from polished chrome to oil-rubbed bronze give you options for every room in the house! Not for use on pre-drilled doors. This traditional round rosette features an elegant beaded border. Beautifully crafted from solid, forged brass, it adds a classic touch to any door. Finished with our exclusive living patina. Can be used on pre-drilled doors. We don't often think of a door stop as a major design element, but this lovely floor mounted model is an exception to the rule! 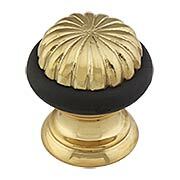 The cap is embossed with an ornate flower pattern, so elegant and attractive you'll hate to mount it behind your door. 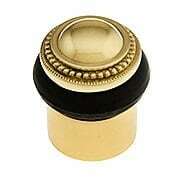 Made of solid brass, with a durable black bumper and 4 classic finishes. We don't often think of a door stop as a major design element, but this lovely floor mounted model is an exception to the rule! The cap is embossed with an ornate beaded edge, so elegant and attractive you'll hate to hide it behind your door. Made of solid brass, with a durable black bumper and 6 classic finishes. Beautifully crafted from solid, forged brass, this traditional round rosette with an elegant rope border adds a classic touch to any door. It comes in our exclusive Antique-By-Hand, a living finish that ages gracefully over time into a beautiful natural patina. Not for use on pre-drilled doors. 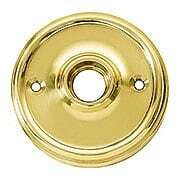 P. & F. Corbin's "Mantua" pattern of 1905 inspired this stately escutcheon plate. 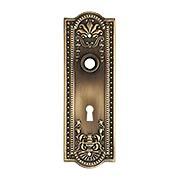 The lavish neo-classical design, originally produced in stamped brass or copper, is recreated in top-quality forged brass. It comes in our exclusive Antique-By-Hand, a living finish that ages gracefully over time into a beautiful natural patina. 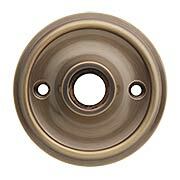 At 2 5/8" wide it works on pre-drilled doors and with vintage mortise locks. 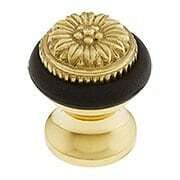 Complete the look with the matching egg & dart knobs (R-01NW-712725-ABH). This lovely classical style back plate was inspired by P. & F. Corbin's "Como" pattern of 1905. 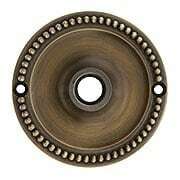 The delicate beaded design, originally produced in stamped brass or copper, is reproduced in top-quality forged brass. It comes in our exclusive Antique-By-Hand, a living finish that ages gracefully over time into a beautiful natural patina. 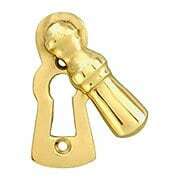 At 2 1/2" wide, it works on pre-drilled doors and with vintage mortise locks. Complete the look with the matching beaded knobs (R-01NW-712733-ABH)! This lovely classical-style back plate was inspired by P. & F. Corbin's "Como" pattern of 1905. 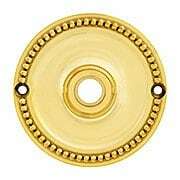 The delicate beaded design, originally produced in stamped brass or copper, is reproduced in top quality forged brass. 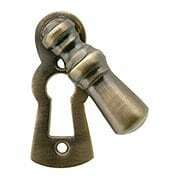 At 2 1/2" wide it works with both pre-drilled doors and vintage mortise locks. 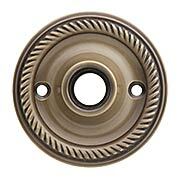 P. & F. Corbin's "Mantua" pattern of 1905 inspired this stately escutcheon plate. 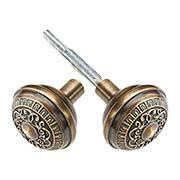 The lavish neo-classical design, originally produced in stamped brass or copper, is recreated in top-quality forged brass. At 2 5/8" wide it works on both pre-drilled doors and vintage mortise locks. 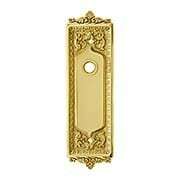 This lovely French-Baroque Back Plate makes your doors really shine. 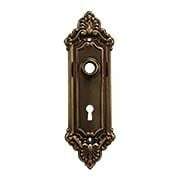 The circa 1910 design has been resized to fit modern pre-drilled doors, but also works with vintage mortise locks. 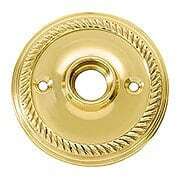 Made of top-quality stamped brass, it comes in an array of classic finish options. 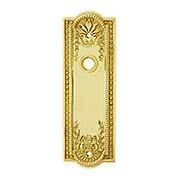 This lovely French-inspired back plate adds instant elegance to doors throughout your home. 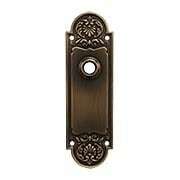 The circa 1910 design has been resized to fit modern pre-drilled doors, but also works with vintage mortise locks. 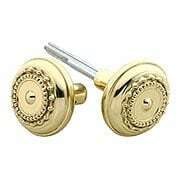 Made of top-quality stamped brass, it comes in your choice of five classic finishes. 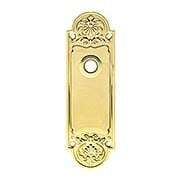 This lovely French-inspired back plate adds instant elegance to doors throughout your home. 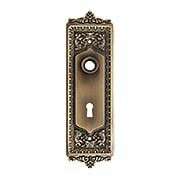 The circa 1910 design has been resized to fit modern pre-drilled doors, but also works with vintage mortise locks. 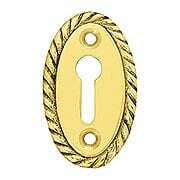 Made of top-quality stamped brass, it comes in your choice of four classic finishes. This traditional round rosette features an elegant beaded border. 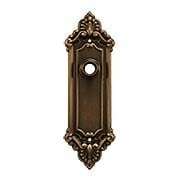 Beautifully crafted from solid, forged brass, it adds a classic touch to any door. Five popular finishes give you options for every room in the house! 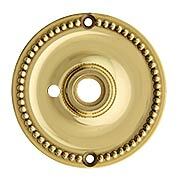 With a 3 1/4" diameter, it is ideal for use on pre-drilled doors. We don't often think of a door stop as a major design element, but this lovely floor-mounted model is an exception to the rule! The cap is embossed with a fluted pattern, so elegant and attractive you'll hate to hide it behind your door. Made of solid brass, with a durable black bumper and your choice of an array of classic finishes. 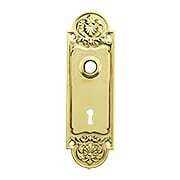 This lovely French-Baroque Back Plate makes your doors really shine. The circa 1910 design has been resized to fit modern pre-drilled doors, but also works with vintage mortise locks. Made of top-quality stamped brass and presented in our exclusive Antique-by-Hand finish, it ages gracefully over time into a beautiful natural patina. 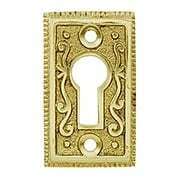 This lovely French-Baroque Back Plate with Keyhole makes your doors really shine. 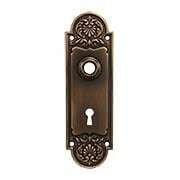 The circa 1910 design has been resized to fit modern pre-drilled doors, but also works with vintage mortise locks. Made of top-quality stamped brass and presented in our exclusive Antique-by-Hand finish, it ages gracefully over time into a beautiful natural patina.